Today we celebrate the birthday of Sir James Dewar, Scottish chemist and physicist, born on 20 September 1842. Dewar was a dynamic, innovative scientist who was responsible for many scientific advances in both chemistry and physics at the turn of the century, but is perhaps best remembered for an innovation that he never received any financial recognition for. In 1892 he developed an insulating flask known as the Dewar flask, which became the inspiration for the legendary Thermos insulating flasks. The design of Dewar’s vacuum flask, commercially introduced by Thermos in 1904, is so simple and elegant that it has remained virtually unchanged to this day, and it remains as useful as it was more than a century ago. 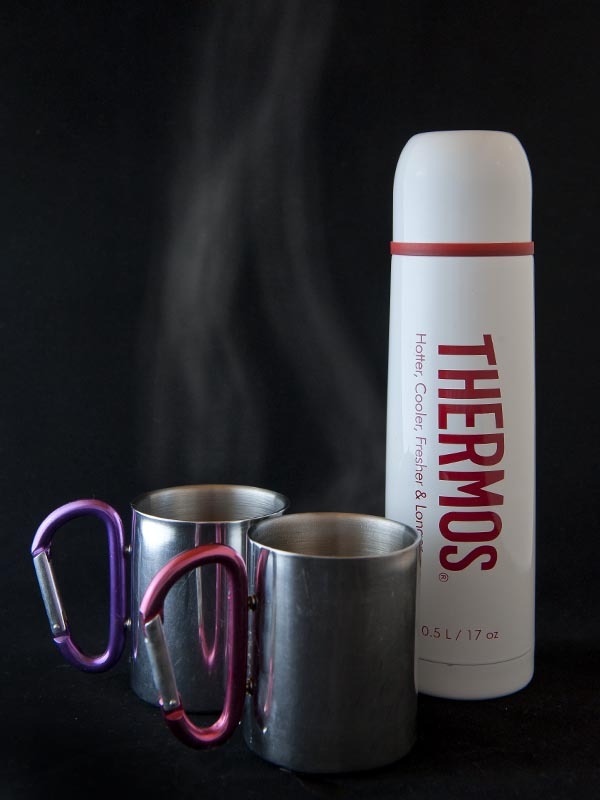 A thermos flask and a steaming cuppa – gotta love a simple, effective design. Dewar’s initial motivation for developing an insulating container came from his work in the liquefaction of gases, where he needed to keep the liquified gases at a very low temperature. In the early 1890’s he designed a vacuum-jacketed container (a double-walled flask with a vacuum between the two silvered layers of steel or glass) to store the gas. The vacuum layer in the flask proved so efficient at preventing the transfer of heat to the gas that he was able to preserve it in liquid form for much longer than was previously possible, thus enabling him to study the properties of the liquified gas in much more detail. Sadly, Dewar never patented his invention, which allowed the newly formed German company Thermos GmbH to take over the concept and develop a commercial version of the vacuum flask. The Thermos flask was an international success, used extensively in both domestic and industrial applications ever since it’s release. The name “Thermos” became colloquially synonymous with vacuum flasks in general, to such an extent that it was declared a ‘genericized trademark’ in the US in 1963. Personally, while I find it sad that Dewar never got any financial recognition for this amazing invention, I have to admit my undying commitment to my good old Thermos flask. It goes everywhere with me – I am seldom on assignment out of town without a trusty flask of hot, home-brewed coffee by my side. Come to think of it, I should definitely pour myself a steaming cuppa from my trusty Thermos in celebration of Dewar and his great invention! Wow, I had no idea that the inventor of the idea of vacuum flasks didn’t make any money off of it. It’s really unfortunate when the business moguls of the world take advantage of the creators, but I suppose creators also have the responsibility to protect their work. Interesting read, thanks!